Ministry of Propaganda - 26/Apr/2004: "Back in Swindon"
I'm back in Swindon, well, kind of. In body, but not really in mind yet. I had a great time at the Islay Walking Week, I've started to prepare my own travelogue from the Islay Walking Week but it will take a few more days until I've completed it. A few journalists were invited as well, Mark Stephen even did an interview standing on girders over a burn. 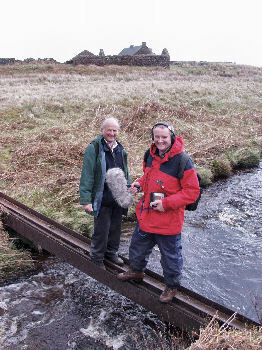 You need to rush, as it will only be online for a week (until the 30th of April), but you can hear (and see some pictures) online on the BBC Scotland Out of Doors page. Go. Now. Listen. Normal blogging should resume once I'm fully back in Swindon and have made some progress with the travelogue. Probably by the bank holiday weekend. In the meantime just expect a few updates about the travelogues progress.